Go to original pattern for design DROPS Baby 18-25. 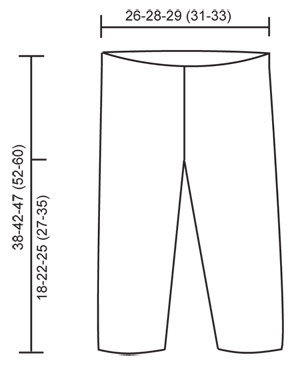 DROPS CIRCULAR NEEDLE (80 cm [32’’]) size 3 mm [US 2or3] – or size needed to get 24 sts x 48 rows in garter st = 10 x 10 cm [4’’ x 4’’]. DROPS WOODEN BUTTON no 511: 3-4-4 (5-5) pcs. DROPS DOUBLE POINTED NEEDLES and CIRCULAR NEEDLE (40 cm [16’’]) size 3 mm [US 2or3] – or size needed to get 24 sts x 32 rows in stockinette st = 10 x 10 cm [4’’ x 4’’]. 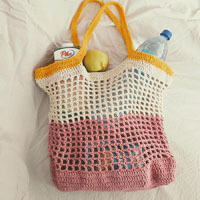 You can get the yarn to make this pattern from	20.20$. Read more. INCREASING TIP: Inc 1 st on each side of st with marker by making 1 YO. On return row work YO into back of st in order to avoid a hole. Worked from side to side from sleeve towards the middle of jacket, in 2 pieces sewn tog mid back afterwards. 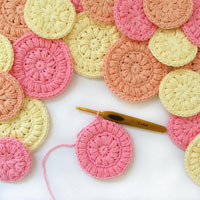 Worked back and forth on circular needle in garter st. Cast on 36-38-40 (40-42) sts on circular needle size 3 mm [US 2or3] with Fabel and work garter st. When piece measures 6-6-5 (5-6) cm [2 3/8”-2 3/8”-2” (2”-2 3/8”)] inc 1 st each side and repeat the inc on every 8th row a total of 6-7-9 (11-13) times = 48-52-58 (62-68) sts. Continue until piece measures 17-19-20 (25-29) cm [6¾”-7½”-8” (9¾”-11 3/8”)] – adjust so that next row is from RS. BODY PIECE: K 1 row from RS, at the end of row cast on 41-43-50 (53-58) sts (= towards back piece) = 89-95-108 (115-126) sts. NOW MEASURE PIECE FROM HERE! Work return row. Insert a marker from RS in the second st on row (= right side of piece) and continue in garter st, AT THE SAME TIME inc 1 st on each side of st with marker on every other row a total of 38-40-46 (48-50) times – SEE INCREASING TIP. 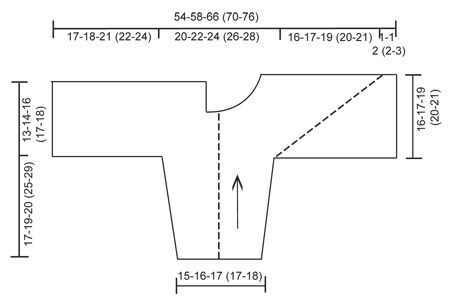 AT THE SAME TIME when piece measures 8½-9-10½ (11-12) cm [3¼”-3½”-4¼” (4 3/8”-4¾”)] continue on the last 60-65-74 (79-86) sts only on the left side of piece as seen from the RS (= back piece). Slip remaining sts on a stitch holder. BACK PIECE: Continue until piece measures 13-14-16 (17-18) cm [5 1/8”-5½”-6¼” (6¾”-7”)] (from where sts were cast on for back piece), and bind off. FRONT PIECE: Slip sts from stitch holder back on needle, but leave 9-10-10 (10-12) sts towards back piece on stitch holder for neckline. Continue to inc on every other row, AT THE SAME TIME bind off 1 st towards neckline on every 4th row a total of 6-7-7 (7-7) times. AT THE SAME TIME when piece measures 14-15-17 (18-19) cm [5½”-6”-6¾” (7”-7½”)] (from where inc for front pieces beg) bind off for 3-4-4 (5-5) buttonholes as follows (from neckline, i.e. from WS): work 2 sts, bind off 2 sts, * work 12-9-11 (9-10) sts, bind off 2 sts *, repeat from *-* a total of 2-3-3 (4-4) times, and then work remaining sts on row. On return row cast on 2 new sts over the bind off sts. After dec and inc are complete there are 90-93-109 (115-121) sts on row. 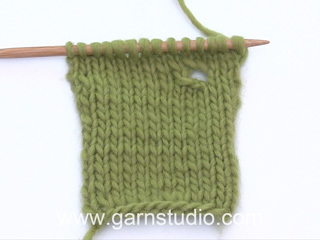 Now bind off 51-52-62 (66-70) sts from WS from neckline and down along front band = 39-41-47 (49-51) sts left on row. Continue in garter st back and forth on these sts for approx 1-1-2 (2-3) cm [3/8”-3/8”-3/4” (3/4”-1 1/8”)] (fold piece double by shoulder to measure front piece to back piece) and bind off. Like right half, but without buttonholes – this half is assembled with WS out. Place the 2 halves towards each other and sew tog mid back – edge to edge in order to avoid a chunky seam. Fold jacket double and sew under arm and side seams in outer loops of sts. Sew on buttons. 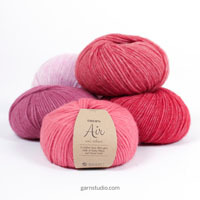 Pick up 55 to 75 sts (incl sts on stitch holders) round neckline on circular needle size 3 mm [US 2or3] with Fabel. Work 3 rows garter st back and forth on needle and bind off. Inc 1 st on each side of the 2 K sts mid back (marker sits between these 2 sts). Inc by working 2 sts in 1 st and incorporate inc sts in rib as you go along. Dec 1 st on each side of marker mid front. Dec as follows before marker: K2 tog. Dec as follows after marker: slip 1 st as if to K, K1, psso. Worked in the round on double pointed needles. 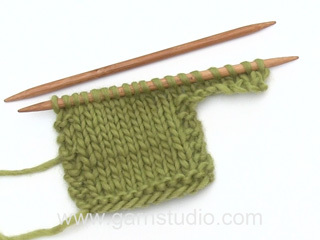 Cast on 56-60-64 (68-72) sts on double pointed needles size 3 mm [US 2or3] with Alpaca. Insert a marker at beg of round = inside of leg. Continue as follows: K1, * P2 / K2 *, repeat from *-* and finish with P2 and K1. When piece measures 4 cm [1½”] inc 1 st on each side of marker by K 2 sts in 1 st on every 5-6-8 (9-12) round a total of 8 times = 72-76-80 (84-88) sts. When leg measures 16-20-23 (25-33) cm [6¼”-8”-9” (9¾”-13”)] divide the piece by marker and continue back and forth on needle (to make it easier to slip both legs on the same circular needle afterwards), AT THE SAME TIME cast on 1 new st each side for seam = 74-78-82 (86-90) sts. When piece measures 18-22-25 (27-35) cm [7”-8¾”-9¾” (10 5/8”-13¾”)] bind off 5 sts each side (= 1 edge st, K1, P2 and K1) = 64-68-72 (76-80) sts. Put piece aside and knit the other leg in the same way. INC MID BACK: Inc 2 sts – SEE INCREASING TIP. Repeat the inc on every 4th round a total of 4 times. DEC MID FRONT: Dec 2 sts – SEE DECREASING TIP. Repeat the dec on every 4th round a total of 8 times. After all inc and dec are complete there are 120-128-136 (144-152) sts on round. 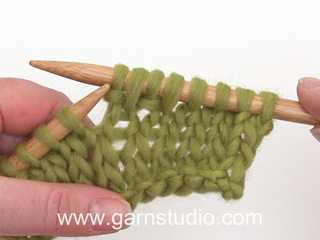 Continue in rib until piece measures 38-42-47 (52-60) cm [15”-16½”-18½” (20½”-23 5/8”)], bind off. Sew inside of legs at the top inside 1 edge st. Sew opening between legs, front of leg towards back of leg. Liebe Gaby, wenn der Ärmel fertig ist, haben Sie 58 M, dann schlagen Sie am Ende der Hinreihe 50 M für das Rückenteil. Dann stricken Sie krausrechts weiter, und gleichzeitig bei der nächsten Hinreihe setzen Sie einen Markierer in der 2. Masche (auf der rechten Seite, von der vorderseite gesehen) und nehmen Sie jetzt in jeder 2. Runde 1 Masche auf beiden Seite der Masche mit dem Markierer (die gepunktete Linie in der Maßskizze) für das Vorderteil zu. dh die Maschen vor und nach dem Markierer wird zunehmen, so bekommen Sie das Vorderteil. Viel Spaß beim stricken! Bonjour .pourriez vous me donner une précision concernant la veste sur la partie dos et devant.il faut faire un jete de chaque côté du marqueur mis à la 2ieme maille tous les 2 rangs.Dois je le faire toujours à partir de la 2ieme maille des 2rangs ou c est le marqueur du début qui reste le repere?merci à vous pour cette precision. Bonjour Evelyne, le marqueur doit rester dans cette maille jusqu'à la fin, et vous augmenterez de chaque côté de cette maille avec le marqueur (ligne pointillé sur le schéma), vous aurez donc d'abord 1 maille avant celle avec le marqueur, puis 2 mailles, 3 mailles, 4 mailles et ainsi de suite. Bon tricot! Just wondering if anyone has joined the backs using 3 needle cast off instead of sewing them together? Dear Angie, we have no information if anyone did that, however it is a good idea, you can certainly try. Happy Knitting! I am totally enjoying myself working on the Killian jacket! I had a few tense moments trying to figure out the neck decreases---thought I had to work decreases on the 10 stitches on the holder until I finally got it! Unravelling 16 rows was a bummer but it's all a learning experience and I'm having a blast! Thanks so much for a really interesting and challenging pattern! The light bulb just went off! So easy. I’m embarrassed I struggled for a whole day over this. Thank you for additional help. Am I to increase at both sides of the body piece? The directions do not say to do that. Dear Cindy, see Increasing tip-1: you have to increase 1 st on each side of st with marker every other row. Happy knitting! I’m having difficulty understanding section, Body Piece. 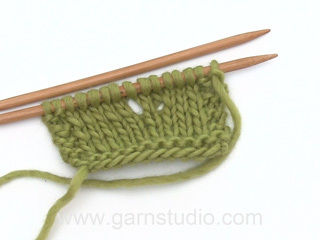 Is the stitch marker placed at the second stitch from the last cast on stitch? Dear Cindy, you have to work one row from right side and at the end of this row you have to cast on the number of sts indicated. Then you have to work a return row from wrong side. Finally, again on the right side, you put a marker in the second stitch, so the marker is at the opposite side of the new cast on sts. Happy knitting! Jeg skal montere bukserne, men synes ikke vejledningen er helt skarp. Skal hvert ben sys sammen øverst langs kantmaskerne på de to "delte" centimeter, så hvert ben bliver de 2 cm længere, eller skal de aflukkede 5 masker på det ene bens forside sys sammen med de 5 aflukkede masker på det andet bens forside og det samme på bagsiden - hvorefter for og bag sys sammen i åbningen mellem benene? Dear Mrs Lee, we successfully could print this pattern, you may have to check your browser/printer settings. Happy knitting! Bonjour, le devant droit se présente comme une pointe plus longue que le dos, et les 47m tricotées ne sont plus dans l' alignement de la bordure du devant. Que faire avec cette partie?Que signifie plier en double à l' épaule pour mesurer le devant par rapport au dos? Bonjour Mme Vignal, le devant doit ressembler au schéma, la ligne pointillé en diagonale à partir de la manche correspond à la maille avec le marqueur (les augmentations se font de part et d'autre de cette maille). Pour vérifier la hauteur, pliez l'ouvrage le long de la ligne pointillé de la manche (= milieu manche et épaule) et vérifiez que le devant soit aussi long que le dos. Bon tricot!